• Oil, Gas, Petrochemical Plant. • Thermal and Nuclear Power Plant. • Textile and Process Industries. • Low-pressure drop in a compact design. • Axial flow path Venturi effect. • Short stroke length reduce closer time. • Self-aligning conical disc is the only moving part. • Minimal pressure drop reduce operating cost. 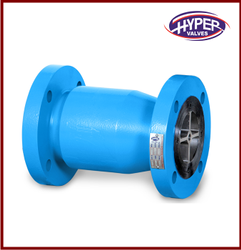 • Reduces valve wear normally associated with turbulent flow from upstream piping. • Fast dynamic response reduces reverse velocity and water hammer potential. 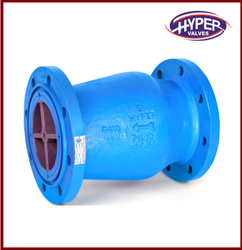 We are offering a wide range of Non slam nozzle check valves. low pressure drop in a compact design. Axial flow path Venturi effect. Short stroke length reduce closer time. Self aligning conical disc is the only moving part. Minimal pressure drop reduce operating cost. Reduces valve wear normally associated with turbulent flow from upstream piping. Fast dynamic response reduces reverse velocity and water hammer potential. Looking for Non Slam Nozzle Check Valve ?